What's Andrew got to do with it? Today is St Andrews’s day, a day on which the Scots, Russians and Greeks who have him as their patron saint do ….? Well what do we do? To be honest I’m not sure what most Scot’s do, we seem to have kept the day and lost all the traditions. I thought about this as I walked home last night and concluded that it is actually quite appropriate for us to think about St Andrews day during advent. My sense of knowing that as a Scot I’m supposed to do something today but I know not what is perhaps like many who know there’s something special about advent and that there’s more to it than candles and coat hangers (this only makes sense if you grew up watching Blue Peter). But they don’t know what to do. We (i.e. society at large) have this period of advent and Christmas day but we’ve lost the context. So here’s the challenge….do I spend advent reflecting upon Emanuel in a privatistic or narcissistic way? Or is part of my reflection upon the birth of Jesus the imperative to help others to find Him, to this advent discover what it’s all about. This leads me to my second thought. Advent a time of preparation, preparation of the heart and mind, Like Lent it’s also a penitential time to reflect and seek forgiveness in readiness to receive Christ a fresh in our lives! God is Emanuel which means God is with us, he’s right in the depths of over lives, of our very beings, experiencing everything we go through, and saying its ok I’m here! God comes to all of us and says I am here, rest on me I will give you strength for today and forever. Our challenge today is to seek God in each other to encourage each other on our Advent journey to our Bethlehem! Who are we looking forward to? Who are we hoping for? Who are we dreaming of? Who are we in love with? Who are we thinking about inside? Who are we eager to avoid? Who are we trusting in? Who are we uneasy around? Who are we shopping for? Who are we ambitious to become? Who are we guilty of lying to? Who are we impatient with? Who are we loved by? 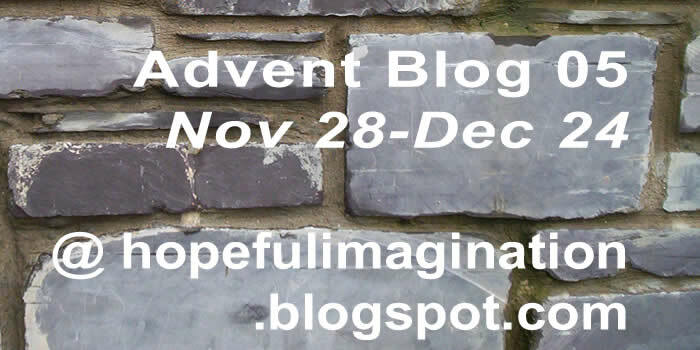 Feel free to blog anything as long as there is some kind of link to advent. at the end of november advent - the beginning of the christian year begins, taking us to christmas.